Structural requirements for the β1 integrin functions in cell adhesion, spreading and signaling have been well documented mainly for fibroblasts. In this study, we examined the reason for the reduced surface expression of β1 integrin in human breast cancer MCF-7 cells compared to normal human breast epithelial (HBE) cells, both of which adhered to collagen type IV. The β1 integrin immunoprecipitates from either HBE or MCF-7 cells involved α-actinin while actin coprecipitated with β1 integrin from HBE cells but not from MCF-7 cells. Immunoblotting using the anti-phosphotyrosine (PY) antibody indicated the phosphorylation of β1 integrin at least at tyrosine in both cells. Dephosphorylation of β1 integrin from HBE cells by protein tyrosine phosphatase (PTP), but not by protein serine/threonine phosphatase (PP), caused dissociation of actin from β1 integrin, although dephosphorylation of it from MCF-7 cells by either PTP or PP caused association of the two proteins. In MCF-7 cells β1 integrin coprecipitated doublet of proteins having the Ca2+/calmodulin-dependent protein kinase (CaMK) II activity that was susceptible to KN-62, a specific inhibitor of CaMKII. The results suggest that β1 integrin is tyrosine phosphorylated and links with actin via α-actinin in HBE cells but prevented from linking with actin in MCF-7 cells by phosphorylation at both tyrosine and serine/threonine of β1 integrin which forms a complex with α-actinin and CaMKII. Thus the linkage formation of β1 integrin with actin may be differentially regulated by its tyrosine and serine/threonine phosphorylation in normal HBE cells and breast cancer MCF-7 cells. The integrin family of surface receptors play a critical role in many cellular processes that include cell adhesion, cell spreading, and growth signaling [1–6]. Integrins interact extracellularly with the substratum such as collagens at specific sites called focal adhesions and intracellularly with many actin-binding proteins such as α-actinin, talin, and vinculin, thereby linking these proteins with the actin cytoskeleton. Links between cell surface receptor β integrins and the actin cytoskeleton are though to be established in more than one way. Integrin binds to talin , which also binds to vinculin [8–10], which in turn binds to α-actinin [11, 12], which then binds to actin. This constitutes a three-protein link between integrin and actin. In addition, talin can also bind actin directly [13, 14], so that talin may form a direct one-protein link between integrin and actin. Similarly, the actin-binding protein α-actinin binds to the β1 integrin subunit . While many isoforms of β1 integrin have been reported [16, 17], a short cytoplasmic domain of 47 amino acids of β1 integrin isoform A contains the three putative domains with the highest affinity for α-actinin . In addition, several amino acids and motifs within the cytoplasmic domain of the β subunit, which are potential phosphorylation sites, have been implicated in the integrin function. The β1 subunit contains a Val-Thr-Thr sequence and these two threonines appear to be important for adhesion of fibroblast cells , and adhesion and invasion of lymphoid cells . However, the relevance of phosphorylation of these amino acids within the cytoplasmic domain of β1 integrin in its function remains largely unclear. Human breast cancer MCF-7 cells have many cellular properties characteristic to malignantly transformed cells; such as an enhanced growth ability in soft agar and poor cell adhesion to the substatum compared to their normal counterpart HBE cells . Poor cell adhesion of MCF-7 cells to the substratum is thought to be mainly caused by a low level of β1 integrin expression on the cell surface . This observation gave a clue to further understanding the relevance of β1 integrin function to cell adhesion, cell spreading, and anchorage-independent growth in cancerous cells. In this study, we examined why only a small population of β1 integrin present in MCF-7 cells is expressed on the cell surface compared to HBE cells, both of which adhere to collagen type IV. Immunoprecipitation and Western blot analysis revealed that intracellular linkage between β1 integrin and actin formed in HBE cells was lost in MCF-7 cells. The relevance of phosphorylation of β1 integrin to its linkage forming ability with actin was also examined in this study using PTP and PP. To determine whether expression of β1 integrin on the cell surface requires its intracellular interaction with the actin cytoskeleton, β1 integrin was immunoprecipitated with the anti-β1 integrin antibody or control IgG from HBE or MCF-7 cells which adhered to collagen IV. Western blot analysis revealed that actin coprecipitated with β1 integrin but not with the IgG precipitates from quiescent HBE cells (Fig. 1A). In contrast, actin did not coprecipitate with β1 integrin or the IgG precipitates from adherent MCF-7 cells (Fig. 1A). To determine whether the failure to coprecipitate actin with β1 integrin was due to the absence of actin expression, whole cell lysates were prepared from HBE or MCF-7 cells, both of which were quiescent and adherent to collagen IV. Immunoblot analysis indicated that total amounts of actin and β1 integrin were comparable between HBE and MCF-7 cells (Fig. 1B). Coprecipitation of actin with β1 integrin in HBE cells and not in MCF-7 cells. (A) Integrin β1 was immunoprecipitated (IP) with the anti-β1 integrin antibody or control IgG from HBE or MCF-7 cells which were quiescent and adherent to collagen IV. The immunoprecipitates were immunoblotted with anti-actin or anti-integrin β1 monoclonal antibody. Molecular size markers are indicated at right in kDa. (B) Whole cell lysates were prepared from HBE or MCF-7 cells which were quiescent and adherent to collagen IV, and equal amounts (5 μ g protein) of the lysates were resolved by SDS-PAGE and blotted. The blots were probed with anti-actin or anti-integrin β1 monoclonal antibody. Molecular size markers are indicated at right in kDa. Interaction between β1 integrin and the actin cytoskeleton is mediated by the actin-binding proteins which are involved in the focal adhesion complex where integrin β1 through its cytoplasmic domain links with the actin cytoskeleton. We next determined which actin-binding proteins mediate this linkage between β1 integrin and actin. Immunoblot analysis of the β1 integrin or control IgG precipitates for α-actinin, talin and vinculin, revealed that only α-actinin among three proteins coprecipitated with β1 integrin but not with the IgG precipitates from quiescent HBE cells (Fig. 2A). Similar to HBE cells, α-actinin, but not talin or vinculin, coprecipitated with β1 integrin but not with the IgG precipitates from quiescent MCF-7 cells (Fig. 2A). Western blotting for the whole cell lysates revealed that total amounts of α-actinin and vinculin in HBE and MCF-7 cells were comparable and that the amount of talin was slightly smaller in MCF-7 cells than that in HBE cells (Fig. 2B). The results indicated that α-actinin coprecipitated with β1 integrin in both HBE and MCF-7 cells. Coprecipitation of α-actinin, but not talin or vinculin, with β1 integrin in HBE and MCF-7 cells. 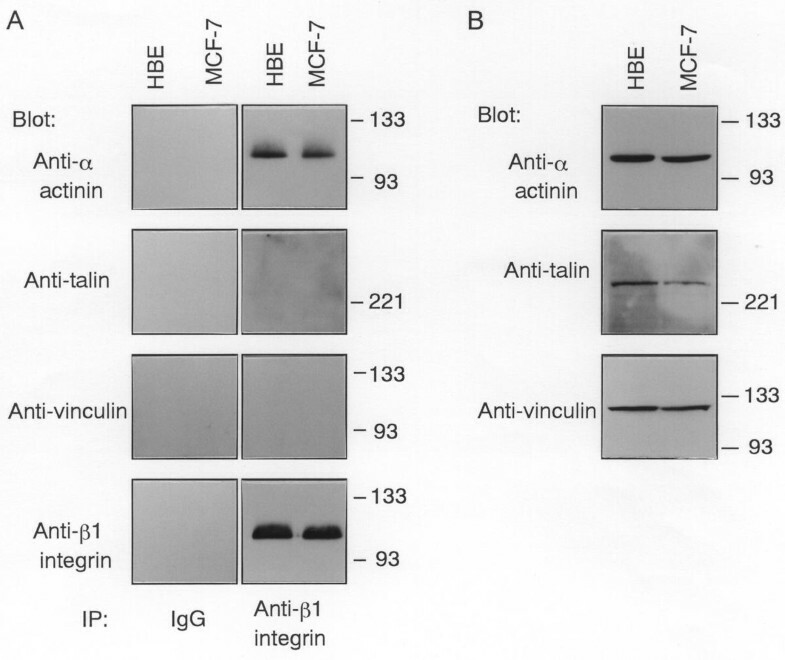 (A) Integrin β1 was immunoprecipitated (IP) from HBE and MCF-7 cells using the anti-β1 integrin antibody or control IgG. The immunoprecipitates were probed with anti-α-actinin, anti-talin, or anti-vinculin antibody. Molecular size markers are indicated at right in kDa. (B) Equal amounts (5 μg protein) of whole cell lysates from quiescent HBE and MCF-7 cells were probed with anti-α-actinin, anti-talin, or anti-vinculin antibody. Molecular size markers are indicated at right in kDa. The cytoplasmic domain of β1 integrin is short and has the putative binding domains for α-actinin . To determine the difference in the cytoplasmic domain of β1 integrin between HBE and MCF-7 cells, total RNA was extracted from the cells and the cDNA that covers the full-length of the cytoplasmic domain of β1 integrin was amplified. 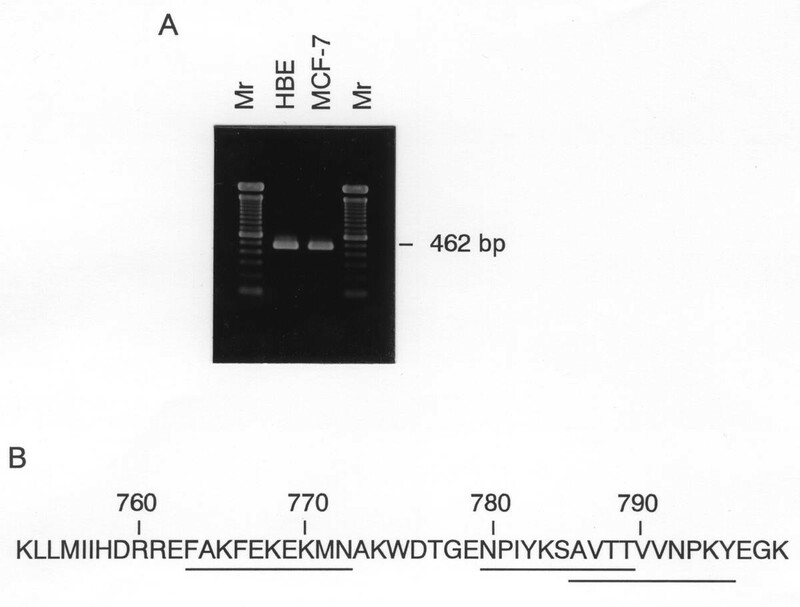 Reverse transcription-polymerase chain reaction (RT-PCR) products from HBE or MCF-7 cells were identical in lengh with 462-bp on agarose gels (Fig. 3A). Sequence analysis of the cDNA fragments of HBE and MCF-7 cells revealed that both fragments were identical to the wild-type cytoplasmic domain of β1 integrin isoform A (Fig. 3B), indicating that there is no difference in the cytoplasmic domain of β1 integrin between HBE and MCF-7 cells. Amino acid sequence of the cytoplasmic domain of β1 integrin in HBE or MCF-7 cells. (A) Agarose gel electrophoresis of RT-PCR products. Total RNA was extracted from HBE or MCF-7 cells which were quiescent and adherent to collagen IV, and cDNA encoding the cytoplasmic domain of β1 integrin was amplified by RT-PCR. The cDNA products were resolved in 1.6% (w/v) agarose gel electrophoresis with molecular size markers (Mr) and stained with etidium bromide. Molecular size of the cDNA products are indicated at right in bp. (B) The cDNA fragments of 462-bp were extracted from agarose gels and sequence analysis was carried out. Amino acid sequences of the three peptides with the highest affinity for α-actinin are underlined (adapted from ). The importance of β1 integrin phosphorylation to its functions which include cell adhesion and invasion has been suggested by many investigations [19, 20, 22, 23]. To determine this possibility, we examined the phosphorylation state of β1 integrin in HBE and MCF-7 cells. Metabolic labeling of cells with [32P]orthophosphoric acid indicated that β1 integrin (110 kDa), and not α-actinin (100 kDa), was phosphorylated in either HBE and MCF-7 cells (Fig. 4A). When the β1 integrin immunoprecipitates were probed with anti-phosphotyrosine (PY) antibody, β1 integrin, and not α-actinin, reacted with the antibody in both HBE and MCF-7 cells (Fig. 4B). This indicates that β1 integrin is phosphorylated at least at tyrosine in MCF-7 cells as well as in HBE cells. The phosphorylation state of β1 integrin. (A) HBE or MCF-7 cells which were quiescent and adherent to collagen IV were metabolically labeled with [32P]orthophosphoric acid and β1 integrin was immunoprecipitated from the cells. After separation on 8% SDS-PAGE, gels were dried and autoradiographed. Unlabeled samples were electrophoresed and transferred onto membranes. The blots were probed with antibodies to β1 integrin and α-actinin. Molecular size markers are indicated at right in kDa. (B) Tyrosine phosphorylation of β1 integrin in HBE and MCF-7 cells. Integrin β1 was immunoprecipitated from HBE or MCF-7 cells and the immunoprecipitates were resolved by 8% SDS-PAGE before blotting. The blots were then probed with anti-PY or anti-integrin β1 monoclonal antibody. Molecular size markers are indicated at right in kDa. To determine the role of phosphorylation of β1 integrin in the link formation between β1 integrin and actin, the β1 integrin immunoprecipitates were dephosphorylated by PTP or PP. Treatment of the β1 integrin immunoprecipitates from HBE cells with PTP resulted in tyrosine dephosphorylation of β1 integrin as assessed by the anti-PY antibody and concomitant dissociation of actin from it (Fig. 5A). In contrast, tyrosine dephosphorylation of β1 integrin from MCF-7 cells by PTP did not affect the absence of coprecipitation of actin with β1 integrin but successive incubation of the PTP-treated β1 integrin with the supernatant of the β1 immunoprecipitates that contained unbound actin or with exogenous human platelet actin caused coprecipitation of actin with β1 integrin (Fig. 5A). The result indicated that β1 integrin in either cells was tyrosine phosphorylated. On the other hand, dephosphorylation of the β1 integrin immunoprecipitates from either cells by PP2A1 did not result in any alteration in coprecipitation of two proteins or the reactivity of β1 integrin with the anti-PY antibody (Fig. 5B). Actin remained coprecipitated with β1 integrin from HBE cells, while it remained dissociated from β1 integrin from MCF-7 cells. However, incubation of the PP2A1-treated β1 integrin from MCF-7 cells with the supernatant of the β1 immunoprecipitates or with exogenous human platelet actin caused coprecipitation of actin with β1 integrin (Fig. 5B). The results indicated that β1 integrin in HBE cells is not serine/threonine phosphorylated but in MCF-7 cells. Effects of dephosphorylation of β1 integrin on its coprecipitation with actin. (A) The β1 integrin immunoprecipitates from quiescent HBE or MCF-7 cells were treated with (+) or without (-) PTP, then immunoblotted with anti-actin, anti-β1 integrin, or anti-PY antibody. The PTP-treated β1 integrin immunoprecipitates from MCF-7 cells were incubated for 30 min with (+) or without (-) the supernatant of the β1 immunoprecipitates containing unbound actin (Cell lysate), or with 5 μg/ml exogenous human platelet actin (A). Molecular size markers are indicated at right in kDa. (B) The β1 integrin immunoprecipitates from quiescent HBE or MCF-7 cells were treated with (+) or without (-) PP2A1, then the PP2A1-treated β1 integrin from MCF-7 cells were incubated for 30 min with (+) or without (-) the supernatant of the β1 immunoprecipitates (Cell lysate), or with 5 μg/ml exogenous human platelet actin (A). The immunoblots were probed with anti-actin, anti-β1 integrin, or anti-PY antibody. Molecular size markers are indicated at right in kDa. Loss of linkage between the cell-cell adhesion molecule E-cadherin and the actin cytoskeleton, that is mediated by a three-protein link of β-catenin, α-catenin and α-actinin, is induced by association of the EGF receptor having the protein tyrosine kinase activity with β-catenin that leads to tyrosine phosphorylation of β-catenin and concomitant dissociation of α-catenin from it [24, 25]. By analogy with this phenomenon, the β1 integrin immunoprecipitates were probed with the antibodies to several serine/threonine protein kinases to determine whether serine/threonine protein kinase associates with β1 integrin. Among these, the anti-CaMKII antibody, which reacts broadly with all CaMKII isoforms, reacted with doublet of proteins having molecular mass of around 56 kDa in the β1 integrin immunoprecipitates but not in the control IgG precipitates from MCF-7 cells (Fig. 6A). These proteins which were reactable with the anti-CaMKII antibody were not detected in the β1 integrin or control IgG precipitates from HBE cells (Fig. 6A). To confirm the CaMKII kinase activity of the doublet of proteins, in vitro kinase assay was carried out using a specific substrate peptide Autocamtide II, in the presence of calmodulin and inhibitor peptides of cAMP-dependent protein kinase (PKA) and protein kinase C (PKC). Whereas the β1 integrin immunoprecipitates from HBE cells exhibited a very low level of the kinase activity that was slightly above that of the precipitates without anti-β1 integrin antibody, the relative kinase activity of the immunoprecipitates from MCF-7 cells was 17-fold (Student's t-test, p < 0.01) above that of the β1 integrin immunoprecipitates from HBE cells (Fig. 6B). When 10 μM KN-62, a specific inhibitor of CaMKII [26–28], was present, the kinase activity of the β1 integrin immunoprecipitates from HBE cells was 7-fold above (p < 0.05) that in the absence of KN-62 (Fig. 6B). Contrary to this, 10 μM KN-62 significantly inhibited the kinase activity of the β1 integrin immunoprecipitates from MCF-7 cells by 92% (p < 0.01) (Fig. 6B). CaMKII binding to β1 integrin in MCF-7 cells. 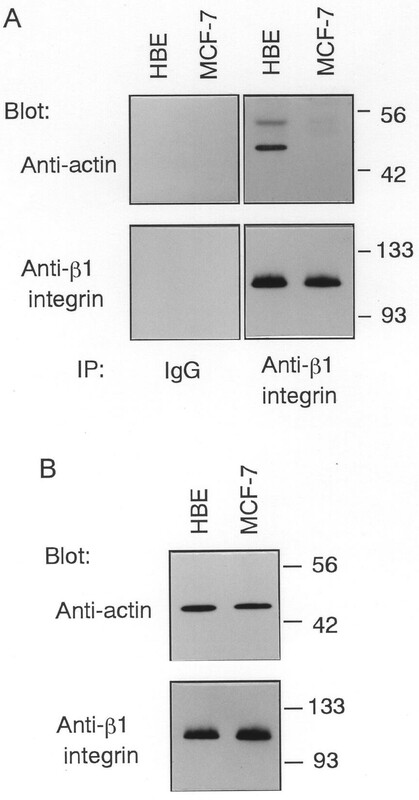 (A) The β1 integrin immunoprecipitates (IP) with the anti-β1 integrin antibody or control IgG from HBE or MCF-7 cells were probed with antibody to all CaMKII isoforms or anti-β1 integrin antibody. Molecular size markers are indicated at right in kDa. (B) The β1 integrin immunoprecipitates from HBE or MCF-7 cells were incubated with the substrate peptide Autocamtide II, calmodulin, inhibitor peptides of PKA and PKC, and [32P]ATP with (closed columns) or without (open columns) 10 μM KN-62 at 30°C for 10 min. After subtraction of the background, the activity was normalized to the amount of β1 integrin and expressed relative to that of the β1 integrin immunoprecipitates from HBE cells without KN-62. Results represent the mean ± S.D. (bars) of duplicate assays of three independent experiments. Immunoprecipitation and Western blotting revealed that actin coprecipitated with β1 integrin from quiescent HBE cells but not from MCF-7 cells. Coprecipitation of actin with β1 integrin but not with the control IgG precipitates from HBE cells indicates that association of β1 integrin with actin is not non-specific. Since actin expression in MCF-7 cells adhering to collagen IV was comparable with that in HBE cells, the result suggests that loss of linkage between β1 integrin and the actin cytoskeleton in MCF-7 cells may not be due to the absence of actin expression. The β1 integrin subunit interacts by its cytoplasmic domain with many actin-binding proteins, such as α-actinin, talin, and vinculin, thereby forming a link between β1 integrin and the actin cytoskeleton [7–12]. Immunoprecipitation followed by Western blotting revealed that only α-actinin, but not talin or vinculin, coprecipitated with β1 integrin but not with the IgG precipitates from both HBE and MCF-7 cells. This indicates the specific association between α-actinin and β1 integrin in both HBE and MCF-7 cells. Whereas comparable amounts of α-actinin and vinculin are present in HBE and MCF-7 cells and slightly reduced level of talin is seen in MCF-7 cells, the result suggests that α-actinin, but not talin or vinculin, may predominantly mediate a one-protein link between β1 integrin and actin in both HBE and MCF-7 cells and that the loss of linkage between the two proteins in MCF-7 cells may be due to the absence of a link between β1 integrin-associated α-actinin and actin. In spite of the fact that α-actinin may directly bind with actin , structural requirements for the functions of the cytoplasmic domain of β1 or β3 integrin in cell adhesion and cell spreading are strongly suggested by many investigations [19, 20, 22, 23]. In addition, there are several isoforms within the cytoplasmic domain of β1 integrin [16, 17]. These observations prompted us to examine which isoform of β1 integrin is expressed in MCF-7 cells. RT-PCR, using a set of primers corresponding to the sequences covering the cytoplasmic domain of β1 integrin isoform A, demonstrated that the same cDNA fragments in lengh were amplified from HBE and MCF-7 cells. Sequence analysis indicated that the cDNA fragments had the identical sequence and corresponded to sequences encoding the cytoplasmic domain of the wild-type β1A integrin. This suggests that both HBE and MCF-7 cells express the same wild-type β1 integrin and that the loss of linkage between β1 integrin and actin may not be due to the structural difference in the cytoplasmic domain of β1 integrin in MCF-7 cells from that in HBE cells. The relevance of phosphorylation of the β subunit of integrin at threonine [19, 20] or tyrosine residue  to the integrin functions that include cell adhesion and invasion has been documented. Therefore we next examined the phosphorylation state of β1 integrin and its relation to the linkage formation with actin. Metabolic labeling of cells with [32P]orthophosphoric acid and Western blotting using the anti-PY antibody indicated that β1 integrin, but not α-actinin, in either HBE or MCF-7 cells was phosphorylated at least on a tyrosine residue and that there was no apparent difference in the phosphorylation state of β1 integrin between two cells. Therefore, the susceptibility of the linkage forming ability of β1 integrin with actin to PTP or PP was examined. Effects of the PTP treatment of the β1 immunoprecipitates from HBE and MCF-7 cells were contradictory; that is, coprecipitation of actin with β1 integrin from HBE cells was lost, while that of two proteins from MCF-7 cells was induced after incubation of the PTP-treated immunoprecipitates with the supernatant of the immunoprecipitates or with exogenous human platelet actin. As the reactivity of anti-PY antibody with β1 integrin from either HBE or MCF-7 cells was lost by PTP and exogenous actin coprecipitated with PTP-treated β1 integrin from MCF-7 cells, alterations in coprecipitation of actin with β1 integrin may be due to tyrosine dephosphorylation of β1 integrin and not other proteins involved in the immunoprecipitates or the supernatant of the immunoprecipitates. In addition, the result suggests that tyrosine phosphorylation is necessary for β1 integrin to link with actin in HBE cells but inhibitory for it in MCF-7 cells. Contrary to this, treatment of the β1 integrin immunoprecipitates with PP2A1 did not result in any alteration in coprecipitation of actin with β1 integrin from HBE cells but caused coprecipitation of the two proteins from MCF-7 cells. As PP2A1 did not affect tyrosine phosphorylation of β1 integrin from either HBE or MCF-7 cells and exogenous actin became coprecipitated with PP2A1-treated β1 integrin from MCF-7 cells as endogenous actin in the supernatant, the results suggested that PP2A1-induced coprecipitation of β1 integrin from MCF-7 cells with actin may be due to serine/threonine dephosphorylation of β1 integrin rather than other cellular proteins and that the ability of β1 integrin to link with actin in MCF-7 cells may be prevented by its serine/threonine phosphorylation. While it appears that phosphorylation at either tyrosine or serine/threonine is necessary for β1 integrin to link with actin and phosphorylation at both tyrosine and serine/threonine prevents β1 integrin from linking with actin, the linkage formation of β1 integrin with the actin cytoskeleton may be differentially regulated in MCF-7 cells as compared to HBE cells by tyrosine or serine/threonine phosphorylation of β1 integrin. Finally we examined whether some protein kinases associate with β1 integrin in MCF-7 cells, using antibodies to several serine/threonine protein kinases. Among these, the anti-CaMKII antibody reacted with doublet of proteins with molecular mass of around 56 kDa which coprecipitated with β1 integrin from MCF-7 cells but not from HBE cells. As the antibody to CaMKII did not react with any protein in the control IgG precipitates from MCF-7 cells, association of the doublet of proteins with β1 integrin may be specific. The results demonstrating that the β1 integrin immunoprecipitates from MCF-7 cells had the kinase activity for a specific substrate peptide, Autocamtide II, under the conditions where calmodulin and inhibitor peptides of PKA and PKC were present and that this kinase activity was completely inhibited by 10 μM KN-62, a specific inhibitor of CaMKII [26–28], suggest that the doublet of proteins which associate with β1 integrin in MCF-7 cells may be CaMKII isoforms. Even though the reason for an elevated level of the kinase activity of the β1 immunoprecipitates from HBE cells by KN-62 is unknown at present, it is possible to assume that some unidentified protein kinases which are responsive to KN-62 may associate with β1 integrin in HBE cells. Coprecipitation of CaMKII with β1 integrin in MCF-7 cells does not imply their direct association. As direct association between CaMKII and α-actinin has been reported by yeast two-hybrid and biochemical assays , CaMKII in MCF-7 cells may bind to α-actinin, which may also bind to β1 integrin, forming a ternary complex with α-actinin and β1 integrin. Whether serine/threonine phosphorylation of β1 integrin in MCF-7 cells is regulated by the β1 integrin-associated CaMKII, or whether loss of intracellular linkage between β1 integrin and the actin cytoskeleton causes the reduced cell surface expression of β1 integrin, are areas for further investigation. Intracellular linkage of β1 integrin with the actin cytoskeleton via α-actinin was formed in HBE cells which adhered to type IV collagen. However, this linkage was lost in adherent MCF-7 cells. The present results suggest that tyrosine phosphorylation may be required for β1 integrin to link with actin in HBE cells, but phosphorylation of β1 integrin at both tyrosine and serine/threonine residues in MCF-7 cells may cause dissociation of actin from it. Thus the linkage formation of β1 integrin with the actin cytoskeleton may be differentially regulated by its tyrosine and serine/threonine phosphorylation in normal HBE cells and breast cancer MCF-7 cells. HBE cells obtained form Clonetics were maintained in serum-free defined medium MCDB 170  supplemented with 10 ng/ml EGF, 1.4 μM hydrocortisone, 5 μg/ml insulin, 0.1 mM ethanolamine, 0.1 mM phosphoethanolamine, and 25 μM prostaglandin E2  at 37° C in a humidified atmosphere of 95% air and 5% CO2. MCF-7 cells were maintained in 5% fetal bovine serum (FBS)-containing RPMI 1640 medium. Subconfluent culture of HBE or MCF-7 cells were harvested with 0.25% (w/v) trypsin-2.65 mM EDTA solution and the cells were replated on 60-mm collagen IV-coated dishes (Becton-Dickinson). HBE or MCF-7 cells were then growth arrested by incubation in an EGF-deprived medium for 3 days or in 0.1% FBS-containing medium for 2 days, respectively. Cells adherent to collagen type IV were lysed in RIPA buffer (10 mM Tris-HCl, pH 7.4, 0.15 M NaCl, 1% sodium deoxycholate, 1% Triton X-100, 0.1% SDS, 1 mM phenylmethylsulfonyl fluoride (PMSF), and 1 mM sodium orthovanadate)  and sonicated briefly using an ultrasonic cell disruptor (Misonix Inc.). The cell lysates were incubated with the anti-integrin β1 monoclonal antibody (Life Technologies) or control IgG followed by Protein A-Sepharose (Amersham Pharmacia). The immunoprecipitates were washed three times with PB buffer (20 mM phosphate buffer, pH 8.6, 0.5% Nonidet P-40, and 0.1% SDS) and boiled for 2 min in lysis buffer (0.0625 M Tris-HCl, pH 6.8, 2% SDS, 10% glycerol, and 5% 2-mercaptoethanol). Whole cell lysates were prepared by homogenizing cells in 1% SDS in 20 mM Tris-HCl, pH 7.4, 1 mM PMSF and 1 mM sodium orthovanadate, and then boiling for 2 min, before sonicating briefly. The protein content was determined using a protein reagent kit (Pierce) with bovine serum albumin (BSA) as the standards. The immunoprecipitates or whole cell lysates were dissolved in SDS-polyacrylamide gel electrophoresis (PAGE) and after electrophoresis the samples were transferred onto membranes (Millipore). The blots were probed with anti-actin (ICN), anti-β1 integrin, anti-α-actinin (Upstate Biotechnology), anti-talin (Chemicon), anti-vinculin (Sigma), anti-phosphotyrosine (PY) (Upstate Biotechnology), or anti-CaMKII antibody (Santa Cruz Biotechnology). After incubation of the membrane with horseradish peroxidase-conjugated secondary antibodies (Amersham Pharmacia), the reactivity was visualized using an ECL kit (Amersham Pharmacia) and X-ray films (Fuji-film). Total RNA was extracted from unstimulated cells which adhered to collagen IV, using TRIzol reagent and then digested with DNase I (Life Technologies). A one-step RT-PCR was carried out using an RT-PCR kit (CLONTECH) at the anealing temperature of 55°C. The primer set for the cytoplasmic domain of β1A integrin was 5'-TCCTATTTTAACATTACCAA-3' and 5'-ACTGTGACTATGGAAATTGC-3' . The PCR products were electrophoresed on 1.6% (w/v) agarose gels and the cDNA was extracted from the gel bands. The DNA sequence was confirmed for both forward and reverse strands of cDNA fragments using the set of PCR primers on an automated DNA sequencer (ABI PRISM 3100, Applied Biosystems). Adherent cells to collagen IV-coated dish were labeled with 100 μCi/ml of [32P]orthophosphoric acid (Amersham Pharmacia) in phosphate-free medium for the last 24 h during incubation to arrest the cells. Immunoprecipitation of β1 integrin and SDS-PAGE of the immunoprecipitates were carried out as described above. After electrophoresis, gels were dried under vacuum and autoradiographed using X-ray films at -70°C for a weak. Immunoprecipitation of β1 integrin was carried out as described above and the supernatant obtained by centrifugation of the immunoprecipitates with the Protein A-Sepharose beads was retained at room temperature. The β1 integrin immunoprecipitates were washed twice with PB buffer and once with phosphatase buffer (50 mM Tris-HCl, pH 7.0, 150 mM NaCl, and 0.1 mM EDTA). Then the immunoprecipitates were treated with or without 1.0 unit of PTP (LAR, Calbiochem) [31–33] for 10 min or 0.1 units of serine/threonine-specific PP (PP2A1, Calbiochem) [34–36] for 15 min in 100 μl of phosphatase buffer at 30°C. In some experiments, the phosphatase-treated immunoprecipitates were washed with RIPA buffer and incubated with the retained supernatant of the β1 immunoprecipitates that contained unbound actin or with 5 μg/ml human platelet actin (Cytoskeleton, Inc.) in RIPA buffer containing 0.2 mM CaCl2 for 30 min at room temperature. Immunoprecipitation of β1 integrin was carried out as described above, and the β1 integrin immunoprecipitates were washed twice with PB buffer and once with 20 mM phosphate-buffered saline, pH 7.2. In vitro kinase assay for β1 integrin-associated CaMKII was carried out at 30°C for 10 min using [γ-32P]ATP (NEN Life Science Products) and a CaMKII assay kit (Upstate Biotechnology) that included specific substrate peptide Autocamtide II, calmodulin, and inhibitor peptides of PKA and PKC. In some experiments, the kinase assay was done in the presence of KN-62 (1-[N,O-Bis(5-isoquinolinesulfonyl)]-N-methyl-L-tyrosyl-4-phenylpiperazine) (Sigma), a specific inhibitor of CaMKII [26–28] at the indicated concentrations. The background kinase assay was carried out using the precipitates with the Protein A-Sepharose beads but without the antibody to β1 integrin. Radioactivity incorporated into the substrate peptide was determined with a liquid schintillation counter. After subtraction of the background, the activity was normalized to the amount of β1 integrin that was quantified by measurement of the band intensity of β1 integrin on SDS-PAGE gels using an image analyzer equipped with a digital camera (EDAS 290, Kodak). I thank Katsuo Suzuki (Laboratory of Biochemistry, Kanagawa Cancer Center Research Institute) for technical help. This work was supported by a grant from the Ministry of Health, Labour and Welfare of Japan for the Second-Term Comprehensive 10-Year Strategy for Cancer Control.